Treat yourself to the best that South Carolina has to offer. Located in the Shore Drive section of North Myrtle Beach, Sands Ocean Club is sure to be a hit with you and your guests. 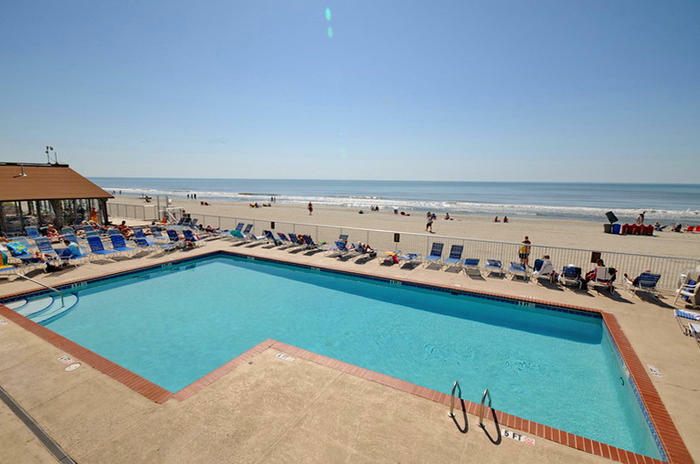 This beautiful oceanfront resort is close to all of what Myrtle Beach has to offer. Sands Ocean Club is a wonderland, with plenty to do at the resort, as well as in the city. Whether you are looking for a budget rental condo, or you are planning to stay in an extravagant suite, Sands Ocean Club has it all. The resort has rooms ranging from cozy one-bedroom, one-bath efficiency rental condos to spacious three-bedroom, three-bath rooms. All condos include covered parking, private balconies, washing machine and dryer units, and high speed Internet access. All of these amenities of the Sands Ocean Club resort and rental condo are yours to enjoy when you choose one of these condos as your home away from home. Take a dip in the on-site swimming pool, or relax as you ride the lazy river while soaking up the South Carolina sunshine. Sands Ocean Club also has an indoor pool for when the weather turns bad or you just need a break from the heat. Sands Ocean Club also has easy access to the beach, where several water recreation activities are offered. Go SCUBA diving, take your younger guest shelling, or just have fun swimming in the beautiful blue water of the Atlantic Ocean. No matter how you spend your time while at the Sands Ocean Club, you will be sure to make plenty of memories. This resort also offers several dining options and experiences. The famous Ocean Annie Beach Bar, which always has live music, is a great place for the adults of your group to go and socialize while enjoying some great food and drinks. The Sandals Lounge and Windows Oceanfront Restaurant are both great options for food as well in North Myrtle Beach, South Carolina. Sands Ocean Club features an on-site spa, whirlpool, exercise room, convenience store, and gift shop to help make guest feel as comfortable as possible while on their vacation. North Myrtle Beach, South Carolina has plenty to do in the city. Test your golfing skills on one of over 100 well-maintained and challenging courses. There are countless miniature golf establishments scattered all throughout Myrtle Beach for the family to enjoy as well. Enjoy the fine dining and entertainment in North Myrtle Beach, South Carolina on your stay to Sands Ocean Club. Elliott Beach Rentals is not affiliated with onsite management or the HOA of Sands Ocean Club.